Satellite-to-ground or air-to-ground communication systems operate at increasingly high frequencies. In the tropical region in particular, significant cloud attenuation on such communication signals has been observed. Therefore, understanding the impact of cloud attenuation on affected communication links is critical for applications with high reliability requirements. Cloud profilers are commonly used to study the cloud coverage and density over an area. Such a cloud profiler – essentially a pulsed Doppler RADAR – is costly and provides information that is generally more suitable for meteorological applications. We propose an alternative lower-cost approach using images taken with ground-based cameras. In terms of camera-/image-based cloud analysis, much of the previous work has focused on satellite imagery and large-scale cloud dynamics for meteorological applications. Ground-based cloud observations have mainly been performed visually at the weather station. Automatic ground-based sky imaging is able to provide cloud data with high resolution in both space and time, allowing us to map smaller scale local features of clouds. Such small-scale cloud data is especially useful for communication links, where the quality of service provided via the link depends on local cloud conditions. We use ground-based cameras to take pictures of the sky at regular short intervals using a fish eye lens. This type of camera is also referred to as whole-sky imager. 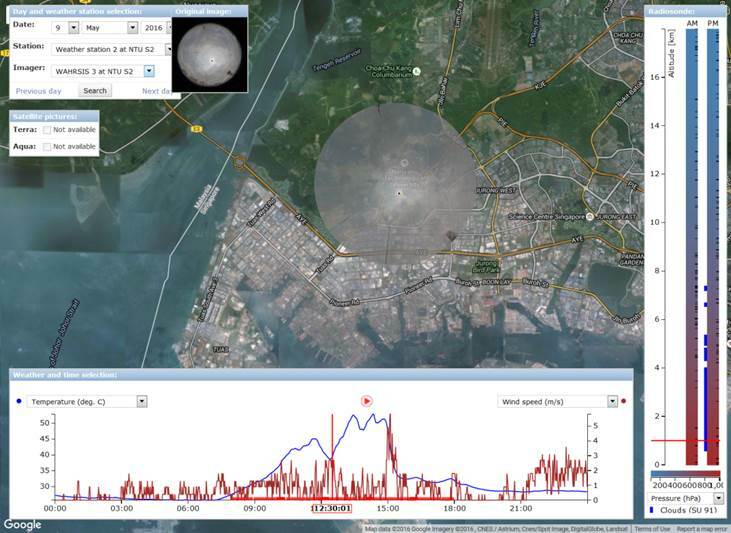 Using image analysis, we can detect clouds, cloud type, cloud cover, cloud bottom altitude, track the movement direction and speed of the clouds, and estimate the cloud attenuation. Measurements with two or more calibrated cameras at multiple locations even allow for cloud mapping in 3D via triangulation. All data collected from weather stations, sky imagers, radiosonde, weather radar, etc. are stored and analyzed on a central server. We have also developed an app for both Apple iOS and Android devices that provides live access to the server.